HAND BOOK OF AUTOMOBILES - by National Automobile Chamber of Commerce Incorporated Contents: An illustrated book featuring the premier automobile companies, and their featured autos. A technical reference with listings of each vehicle, listing: colors available, cylinders, horsepower, cooling, ignition, starting system, wiring, transmission, drive, rear axle, seating capacity, as well as price (if company lists them). Each vehicle listing has one side-profile illustration of the vehicle. Index of gasoline passenger, commercial and electric vehicles. A total of 118 automobile companies listed (some overlap between passenger and commercial gasoline vehicles). A rich and extremely useful reference for early vehicle enthuasists. Example featured companies: Studebaker, Buick, Pierce-Arrow, Chandler, Haynes, Chevrolet, Allen, Mercer, Olds, Fiat, Cadillac, Packard, etc. 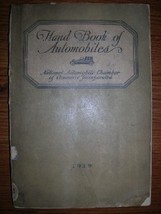 Book Description: New York: National Automobile Chamber of Commerce Incorporated, 1919. (16th Annual Hand Book) Dark tan paper covers (softcover) in no dust jacket. Measures 5-3/8" x 7-3/4" tall. 205 pp. Full alphabetical index of all vehicles, including description of officers of the Nat'l Automobile Chamber of Commerce (2 pages). Condition: Overall, good condition, with flaws noted: Soiling and darkening to paper covers. Covers have chipped head and tail of spine. Front and back covers loose from text block. Some sections of outer spine seperated (but attached) to text block. Previous owner's spine label removed, with white marking on front, spine and rear cover. Previous owner's embossed stamp present on two interior pages (front two title pages). Interior contents very clean and tight. No interior writing present. Not ex-library. Please take a look at my store to view my other collectible items: HTTP://WWW.NWPRESSBOOKS.COM PAYMENT POLICY: Buyer to complete payment within seven (7) days of a winning sale. All payments to be made in US Dollars. Payment by Paypal is preferred. SHIPPING POLICY: INSURANCE: Optional; however I will not be responsible for uninsured items which are damaged or lost. Items over 100 will have insurance required. When possible, multiple items will be packaged together to reduce shipping charges. I will gladly hold previously won purchases for up to seven (7) days if you want to bid on other sales and combine shipping. INTERNATIONAL CUSTOMERS: Please contact me for a shipping quote, as options are available for inexpensive services. PAYPAL UNCONFIRMED ADDRESSES: I am unable to ship to unconfirmed addresses. If you have an unconfirmed address, please take the time to confirm it within Paypal prior to paying for your item. I will cancel your order and refund your Paypal payment if you proceed to pay and have an unconfirmed address. RETURN POLICY: (BID WITH CONFIDENCE!) Prior notice is expected within 7 days of receiving the item. Return within 14 days in the same condition that they left my store. Buyer is required to ship using delivery confirmation. Buyer is responsible for the cost of return shipping unless the reason for the return is a mistake in the listing. Autographs are unconditionally guaranteed authentic in perpetuity. For items with no listing errors, a 10% restocking fee will be charged. This is my ironclad return policy, which protects both buyer and seller.